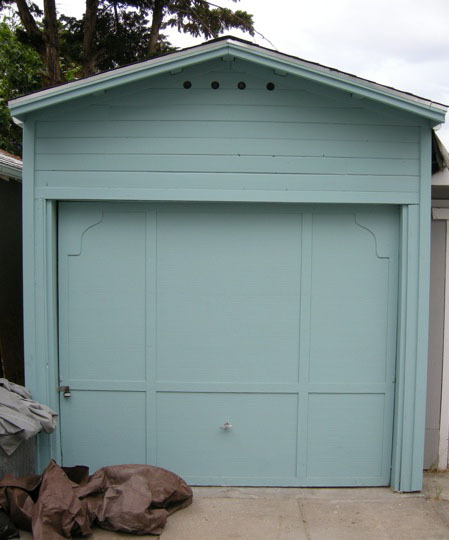 I recently completed a fabulous project on a tiny detached garage in Oakland, California. 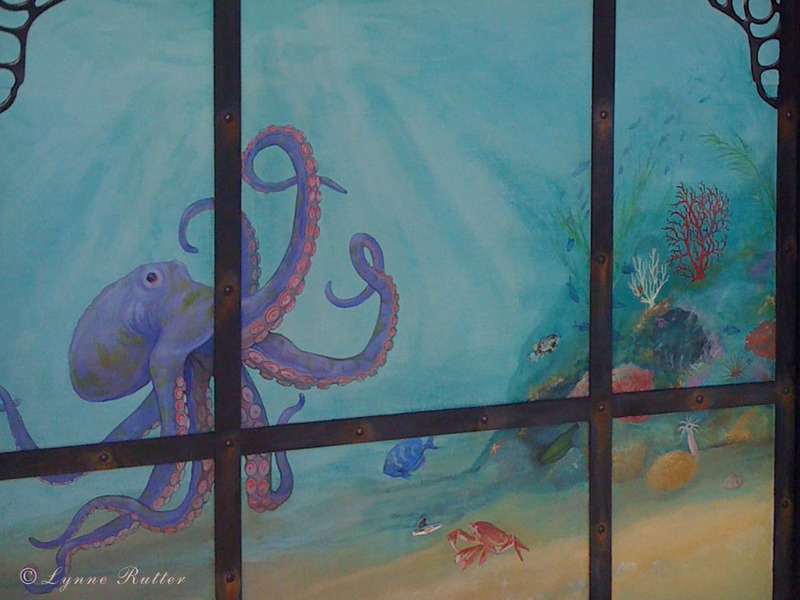 My client is an avid scuba diver who loves all things Victoriana, and has a special attraction for octopi. So I devised a plan for a Jules Verne-inspired aquarium. 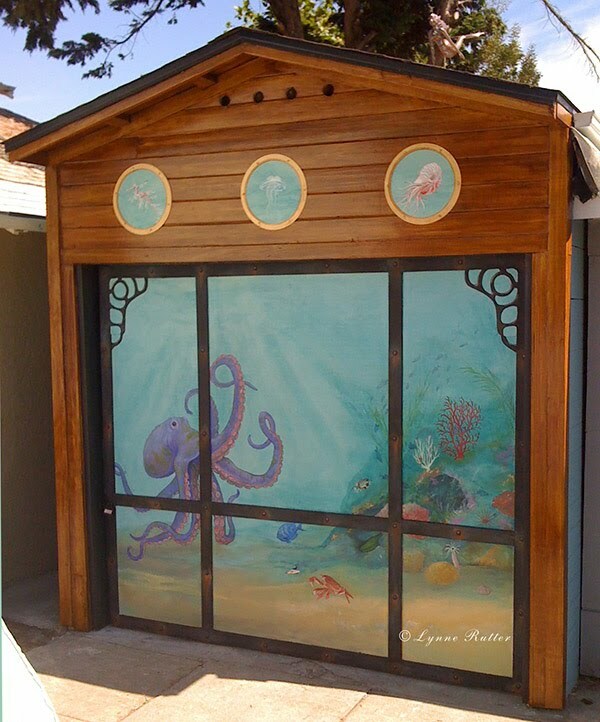 I designed the mural to incorporate the entire structure: the garage door became the glass "tank" and the building its "case." In retro- steampunk fashion, trompe l'oeil rusting iron bolts and cast-iron brackets hold the aquarium tank together in a Victorian-style oak woodgrained case. The mural is completed with three portholes at the top and protected with several coats of UV varnish. Its beautiful, Lynne. Love it! Love, love the portholes! The water color is nice with the filtered light coming in. Love the iron corners and rivets! Very nice work. Cait, Modern Masters is making exterior UV acrylic topcoats that are really nice. "Master Clear" is satin or semi gloss. Yhe "dead flat exterior" with UV protection is fairly new. not sure if they sell MM in the UK though I can't imagine why not. We get *some* MM...I did have chats with Kelly King about becoming a distributor here but decided against. Many of the products are manufactured in Spain so it should be easier to get than it is. I will set about finding out if I can buy here in EU and if not might grab some from USA. Ta muchly. I just saw this on The Steampunk Home blog and I had to come tell you how awesome I think it is. Did you also paint the woodgrain??? Amazing.